Appleton Marble and Granite Works has a long standing reputation for providing excellence in quality and service to families in Wisconsin. The business, located then on West College Avenue, (originally named Fox River Valley Marble, Granite and Cut Stone Works) was founded in 1887 by George Wolf and was later incorporated as Appleton Marble and Granite Works in 1916. August Knuppel purchased the business from George Wolf in the early 1900's to make use of the large granite saws to cut building stone used to construct many of the original downtown Appleton business buildings. After the purchase he invited his 2 nephews Anton and John to join the business. Anton and John came over from Germany in 1923 and began learning the trade. In 1928 August convinced Anton and John Knuppel to take over the company along with Wolf's son-in-law Edwin Rachow. When the Depression set in, Anton and John were only able to pay off half of a $22,400 loan from August Knuppel. At that point they worked out an agreement and the company survived. They paid off August Knuppel and in the late 1940's bought out Rachow's interest. In 1967, Anton bought out his brother John's interest in the company and became sole owner. Five years later Tony, Anton's son, began working full time in the business. In 1978 Tony bought the company from his father on a land contract basis. Tony, who remembers sweeping floors and helping his father stoke coals at the 908 North Lawe St. site, has worn many hats including design, sandblasting, hand tooled work and monument setter. He currently serves as president and general manager as well as sales. Today the business, located at 1708 East Wisconsin Avenue has 12 full time employees and 12 part time sales people in Chilton, Seymour, Shawano, Clintonville, Waupaca, Plover, Wittenberg, Antigo, Oshkosh, New London, Wautoma, and Beaver Dam areas and serves the entire state of Wisconsin. 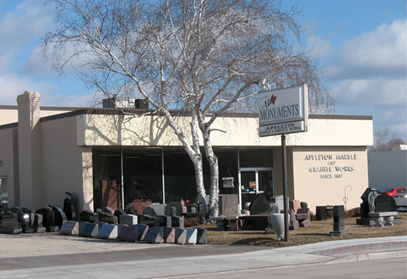 Appleton Marble also owns Schlaefer-Martin Memorials on Velp Avenue in Green Bay where four full time employees have worked since 1985. 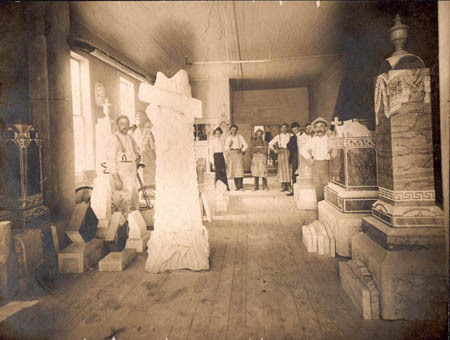 In the "early days" it took 20 to 25 employees to hand chisel and pain stakingly craft each monument. With new technology (although most work is still done by hand) 10 to 12 skilled employees can accomplish the same work load. Tony understands why the company continues to be successful after 125 years serving Wisconsin area communities. 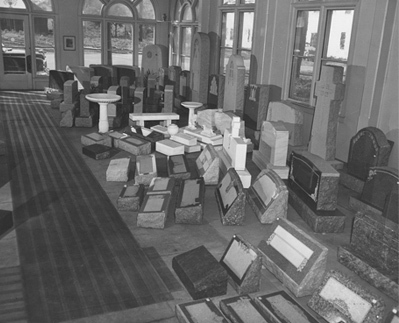 "We provide the opportunity to celebrate the life of a departed loved one, family member or friend by working closely with families in planning a fitting memorial. We sell "remembrance" and help families in a dignified and pleasant way."